We here at West End Solutions aren’t very creative when it comes to attention-grabbing infographics. We barely even know how to Photoshop an image. 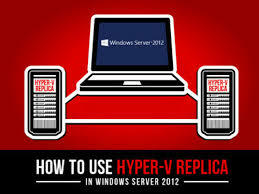 Luckily, this geek stumbled across this wonderful infographic on how to best utilize Windows Server 2012 Hyper-V Replica, which is the Microsoft answer to VMware’s Fault Tolernace and High Availability within virtual environments. Specifically, we get to see how to manage planned, unplanned, and test/dev downtime with virtual machines as well as the setup for each scenario. The simple list of what’s needed in terms of hardware: a couple physical hosts, a network, sufficient storage (SAN/NAS is not required), and enough available network bandwidth to migrate your replica test machine to the second host. It really is gorgeous and informative, but it’s also a really large file (1.8MB), so be warned, Caribbean. Credit to the marketers/trainers across the pond in the UK at Fire Brand Training for creating this beauty.